In this tutorial, you will learn how to use Twitter Bootstrap toolkit to create nav, tabs, and pills based Navigations. Two CSS classes .nav and .nav-tabs are used to create basic tab based navigation. In Twitter Bootstrap Version v2.0.1, styles for CSS class .nav are declared from line number 2176 to 2220 (some related styles also exist there). Line number 2222 to 2267 contain styles for .nav-tabs. Following example shows how to create a basic tab based navigation using Twitter Bootstrap. Once you know how to create a basic tab based navigation with Twitter Bootstrap, it is easy to create basic pill based navigation. Instead of using .nav-tabs class, .nav-pills class is used here. Styles for .nav-pills reside from line number 2222 to 2224 and again from line number 2268 to 2280 of bootstrap.css (used in the last example). 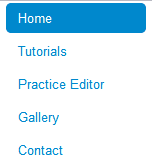 Following example shows creating a basic pills based navigation. To create stacked or vertical tab-based navigation, you have to add .nav-stacked in addition to the .nav and .nav-tabs classes (which creates default horizontal tab based navigation) to your markup. From line number 2281 to 2309 contain styles for .nav-stacked. Following is an example. Similar to creating Stacked or Vertical tabs, you need a CSS class, in addition, to create a Stacked or Vertical pills based navigation. It is .nav-stacked class, which resides from line number 2281 to 2309 contain styles for .nav-stacked. Following is an example. 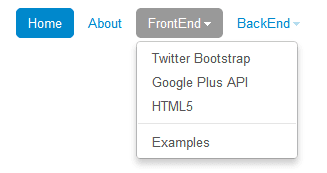 You may create tab based dropdown navigation using Twitter Bootstrap. There are four CSS classes - .dropdown, .dropdown-toggle, .dropdown-menu and .caret which you need in addition to the .nav and .nav-tabs classes for that. In bootstrap.css (version 2.0.1), line number 1545 to 1547 contains styles for .dropdown class, line number 1548 to 1553 contains styles for .dropdown-toggle, 1576 to 1632 contains styles for .dropdown-menu and line number 1554 to 1575 contains styles for .caret. In the example shown, also another CSS class .divider is also used, but this is not required. Note: We have added a separate style tag and included a small set of style to create a top margin of 200 pixel for the holding container. But this only for demonstration purpose only. data-toggle is a Twitter Bootstrap specific attribute. Setting it's value to "dropdown" creates a dropdown navigation. Markup and CSS you need for creating a dropdown navigation based on pills, is similar to that of tab bases dropdown. Only thing is, you need to replace .nav-tabs with .nav-pills class. Here is an example. 2201 to 2221 of bootstrap.css (version 2.0.1). Here is an example. You may create tabbable navigation with Twitter Bootstrap's lightweight Jquery Plugin and simple markup. How do you create Tabbable nav? You need a CSS class called "tabbable" which works as a wrapping division. Within that you add "nav" and "nav-tabs" classes to a "ul" element. Within that, using 'data-toggle="tab"' (applied to the associated anchor element) you create tabbable sections. And then, with CSS class "tab-content" you create a divs and that div may hold several divs with CSS class "tab-pane" which holds the actual content. You need two JS files included to make the Tabbable Nav work - jquery.js and bootstrap-tab.js; both are located with docs/assets/js folder. Following example shows Tabbable Nav in action.